Peter (1886-1965) and Olympia (1892-1962) Tityrn and six children moved to McBride in 1925. Another two children were born in the valley. Peter came to Canada as a boy from the Ukraine. He started a long career on the railroad in 1902 as a track laborer in Manitoba. At Portage la Prairie in 1906, he joined the Grand Trunk Pacific, and moved west with the construction gangs. In 1914, at Fort Fraser, British Columbia, in charge of a gang of 400 men, he drove the last spike linking east with west on the north line. The Canadian National Railroad inherited the bankrupt Grand Trunk Pacific in 1921. Tityrn served on various sections of the CNR’s Smithers division before moving to McBride, where he bought a quarter-section east of town. He continued to work for the railroad while clearing the land, with the help of sons Walter and William. 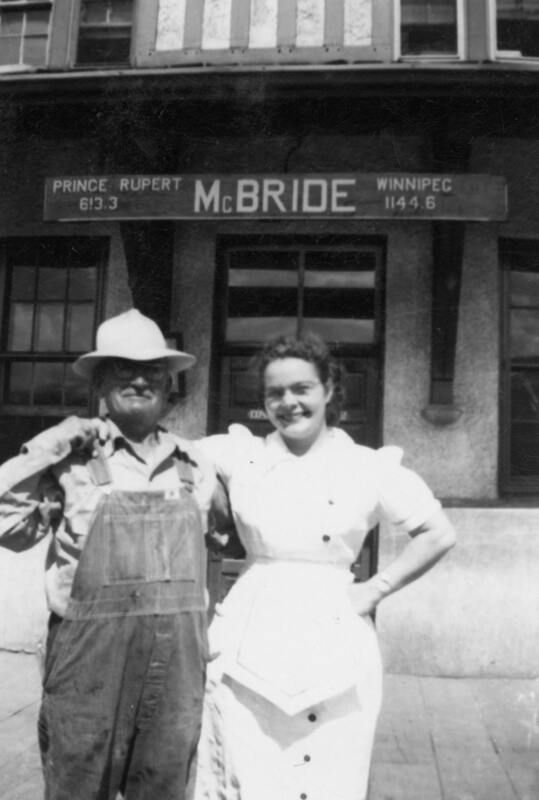 He retired in 1950 and moved into McBride. Peter was a charter member of the McBride Elks and a member of the Farmers’ Institute. Before Tityrn Road was high graded and widened, it would drift in with snow in the fall and remain that way until spring. The only way out was with horse and sleigh, or on foot. “Though we had to walk that long road to school and town, there are still many fond memories of a happy, ambitious, hard-working family who once lived at the end of this road,” recalls Rose Callaghan (nee Tityrn).